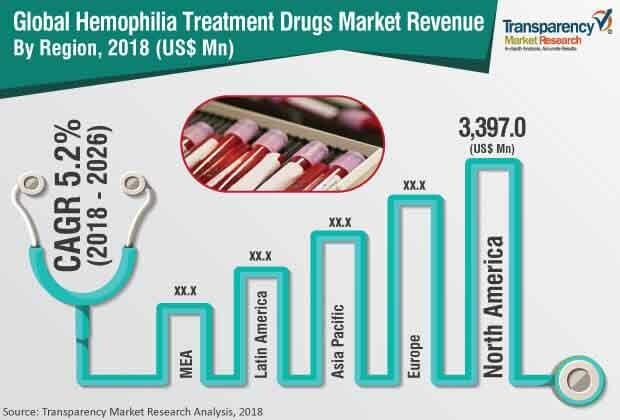 The global hemophilia treatment drugs market was valued at US$ 10,000.0 Mn in 2017 and is projected to expand at a CAGR of 5.0% from 2018 to 2026, according to a new report published by Transparency Market Research (TMR) titled “Hemophilia Treatment Drugs Market – Global Industry Analysis, Size, Share, Growth, Trends, and Forecast, 2018–2026”. The report suggests that increase in prophylactic treatment and presence of leading players are likely to fuel the demand for hemophilia treatment drugs in the near future (2018 to 2026). In addition to the traditional drugs used for hemophilia treatment, the report also includes new products, such as bispecific antibodies & next generation recombinant products, and upcoming treatment options, such as gene therapies, which are expected to witness significant rise in demand during the forecast period. North America dominates the global hemophilia treatment drugs market due to high awareness levels among patients about the condition. Rapid expansion of emerging markets, such as India, China, and Indonesia, is likely to boost the hemophilia treatment drugs market in Asia Pacific at a CAGR of more than 5.5% from 2018 to 2026. Globally, manufacturers of hemophilia drugs along with government and non-government organizations are focusing on nationwide campaigns in order to create awareness about the condition among the general population, which is expected to help increase the diagnosis rate for the condition. Biopharmaceutical companies have adopted multi-pronged strategy of increasing awareness levels for hemophilia, through caregiver and patient-focused educational programs. In addition to building awareness levels for the condition through peer support and life coaching programs, companies such as Pfizer, Inc., Novo Nordisk have also made significant investments to develop innovative treatment options for addressing the large unmet needs of the patient population. Additionally, companies in the hemophilia treatment drugs market are increasingly partnering with each other along with research institutes to develop new treatment options in order to address the current and future unmet needs for hemophilia treatment. In May 2017, Pfizer Inc. entered into a global license and collaboration agreement with Sangamo Therapeutics, Inc. to develop and commercialize gene therapy programs intended to be utilized for Hemophilia A. The hemophilia A segment held a leading share of the market in 2017. It is likely to expand at a robust growth rate of more than 5.0% during forecast period. High pool of hemophilia A patients, globally, along with initiatives aimed at developing and commercializing novel products for its treatment are boosting the segment’s dominant position in the overall market. Hemophilia A is followed by hemophilia B and others segment in terms of market share. North America dominated the global hemophilia treatment drugs market in 2017. It is likely to maintain its leading position in the market, in terms of revenue, during the forecast period owing to high awareness levels about the condition among patients in the region along with favorable reimbursement policies. However, the market in Asia Pacific is expected to grow at a rapid pace due to large pool of hemophilia patients, rise in diagnosis rate for among the general population in developing countries in the region, and increase in critical care funding. The market in Middle East & Africa was valued at around US$ 700 Mn in 2017. The market is projected to expand at a CAGR of more than 4.0% from 2018 to 2026. Rise in government initiatives for promoting awareness about the condition and development of healthcare infrastructure in the region are likely to boost the market in the region. Prominent players operating in the global hemophilia treatment drugs market include Pfizer, Inc., CSL Behring, Kedrion, Shire Plc., Novo Nordisk A/S, Bayer AG, F. Hoffmann-La Roche Ltd., and Sanofi. Inorganic growth strategies along with new product launches are important strategies followed by major players in order to broaden their product portfolios and strengthen their market position. Acquisition of Baxalta by Shire Plc, in 2016, has helped the latter to gain a leading position in the hemophilia treatment market. It has also helped Shire add a basket of products used in the treatment of rare blood diseases, immune system disorders, and cancer to its current portfolio.